One of my favorite comedy routines that I heard back in my high school years was one by Paul Stookey of Peter, Paul and Mary fame. Since it was part of the PPM program, not only was it humorous but it also made one pause and think. It was about magazines. “There was one publication called Life,” began Stookey. Just think, a publication devoted to everything, very inclusive. Then another publication came along called, People. Not quite the same coverage as Life, but still, there are a lot of people in the world. Then something happened and we ended up with a publication called US. Our focus had narrowed, and Stookey, giving his famous knowing and bewildered look would say it implied there should be a publication called Them. Stookey wound up his routine with his prediction of a magazine in the future which would be called Me and would only have bright shiny glass-like pages. A roar of laughter and groans greeted this final punchline. Maybe times have changed, or maybe not, but alongside Life and People there was a Methodist publication written for the whole family. Go into almost any Methodist home between the end of World War II and the mid-1970s and there on the coffee table, next to Life or Time or Newsweek, was Together magazine. When you think about it, it was an interesting name for an interesting time. The Commission is pleased to have a full run of this important publication from the middle of the twentieth century. The title suggested that the denomination viewed all church members, whatever their stage of life, as being in this life "Together." As it turns out, despite several awards and overall quality, the publication had limitations. In an era of increasing specialization it tried to focus on a common core and stands as an important barometer of that changing time. A magazine is more than just the text on the page. In this article I will focus on the publication's artwork and images. Together magazine was one of the more lavishly produced publications of the denomination. It was a monthly which contained in-depth articles touching on a variety of issues of the day, often written by national leaders, and not just leaders in Methodism. It had color in an age when color pages were expensive. And it had original images created for many of its articles. Today an artist would create an image for publication perhaps with PhotoShop, Gimp, or some other drawing app. It could be a mixture of images and artwork. Back in the 1950s and 1960s, those choices didn’t exist. For example, if you wanted an image of Capt. Webb preaching in New York during the American Revolution, or a circuit rider blazing a trail across Ohio in the early 1800s, those images didn’t exist. Webb’s actual portrait hangs in the UM Archives & History Center and is well-posed. However, the portrait doesn’t give much insight into Webb's gifts as a moving preacher. Enter Floyd Johnson the Arty/Layout editor and staff artist. Johnson was responsible for the "look and feel" of the magazine and when necessary he would create an image for the publication. He was not the only artist on staff. His part of the official record of Together was to illustrate the articles. He would paint the needed image using historical pieces for reference to get the "right look." The paintings he created for publication were large, about 3 feet by 4 feet. The work was done quickly, photographed, and the image used in a rotogravure or offset lithography printing process. The pages on which his artwork appeared were made of heavier paper, which easily withstood the multiple times the paper had to go through the printing process (usually three). The results were wonderful images which were used in historical articles, seasonal articles, images of harvest and home at Thanksgiving, and biblical images at other times during the year. The Commission is fortunate to house the largest collection of Johnson's paintings here in Madison, New Jersey, as part of the denomination's historical record. His paintings can also be found at Epworth-by-the-Sea, in the South Georgia Conference Collection, Lake Junaluska in North Carolina, Lovely Lane UM Church in Baltimore and Historic St. George’s UM Church in Philadelphia. There are likely others stored around the country. The images on this site are a representative sample of his work with a historical theme. 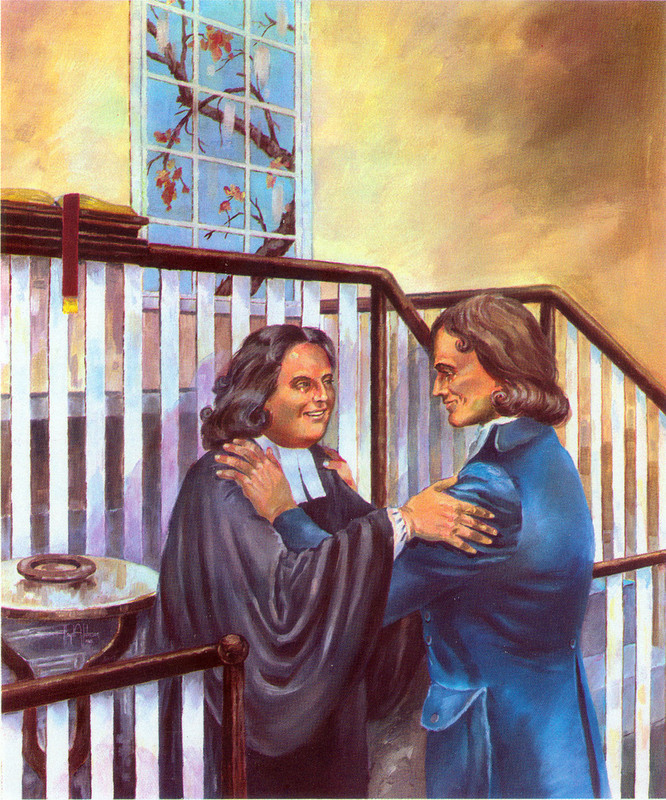 The following set of images were taken from the May 1966 issue of Together Magazine as part of the bicentennial celebration of the arrival of Methodism in the U.S. In addition to historial re-creation, Johnson also did a series on the Lord's Prayer (May 1961) and the Twenty-third Psalm (May 1960). In this image Johnson creates an image of a Sunday morning gathering at Rehoboth Church in Union, West Virginia. Learn more about this Heritage Landmark. Johnson has used bright colors to draw our eyes into the image whose purpose was to accent the text. Note Johnson's style in dealing with the frontier. You will notice that just about all the men wear buckskin; a standard way to portray them back in the 1960s. This classic image is still used in some publications and displays, from time to time. 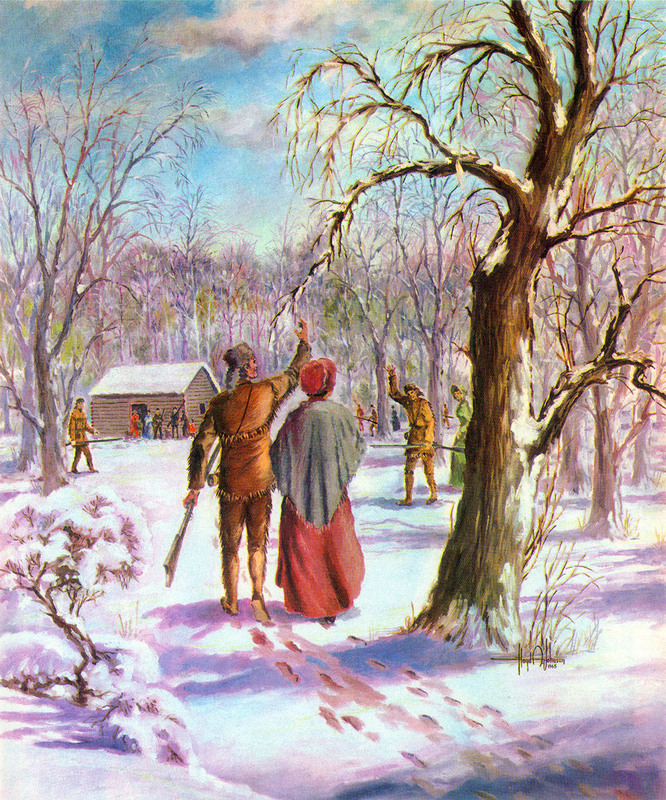 The image is Johnsons' portrayal of the meeting of Coke and Asbury at Barrett's Chapel in Frederica, Delaware at the beginning of the Christmas Conference in 1784. Learn more about this Heritage Landmark. Johnson's intent was to impart movement to illustrations of these types of events, especially when so many of the images of our early leaders where just static portraits. Lastly, this is an image which has a curiously modern twist if you are looking for it. 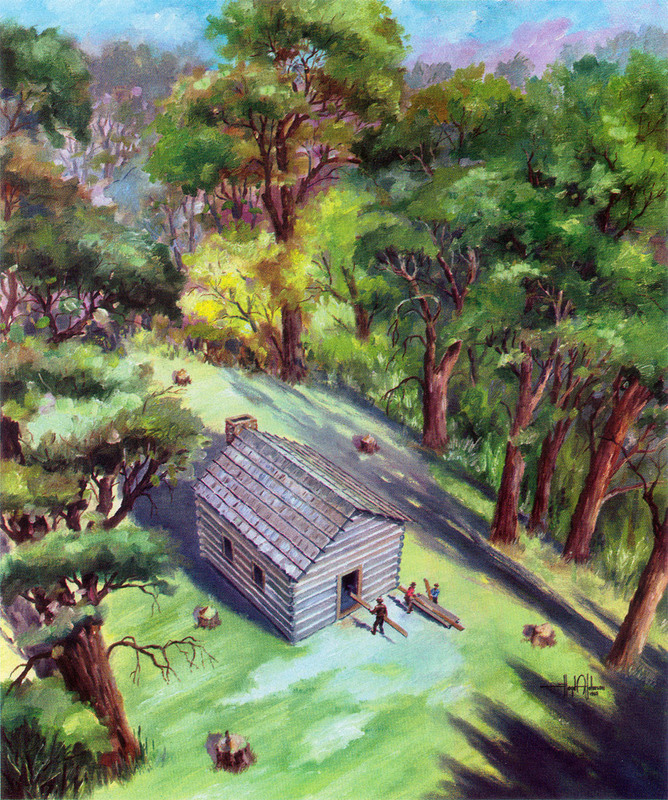 This is Johnson's rendering of the building of "Old McKendree Chapel" which is near Jackson, Missouri. Learn more about this Heritage Landmark. The image, no doubt, is meant to give us a "bird's eye view" of the creation of this chapel; perhaps as an old crow flew over the site just as the workers below were carrying in lumber for either the walls or the benches. But it also has a strangely modern feel too, as if someone had launched a drone with a camera high above the site. These are just a few of the images that appeared in the pages of Together. Looking at them reminds us that records need not only be text, they can be found in a wide range of image and even audio formats. All are integral to our collection of materials reflecting our connection's history of emphasizing the importance of communicating ideas from one person to another.